“I had no idea what to expect from this, but I learned about things I never even knew I would have an interest in, and the talks about well-being in the evenings helped to bring together what we learned during the day. It was real fun, especially the fish wheel, the fishing, and the sled-making, and now I know how to do things [traditional knowledge skills] that I knew nothing about—so cool, and so uplifting! Intended as a place of learning for Indigenous and non-Indigenous peoples alike, the White Eye Traditional Knowledge Camp is an effort to preserve and revitalize the local traditional Indigenous knowledge carried by Gwich’in culture-bearers, and to pass this on to younger generations who can use it in their day-to-day lives—both for external needs and as internal ‘tools’ for coping with life’s challenges. 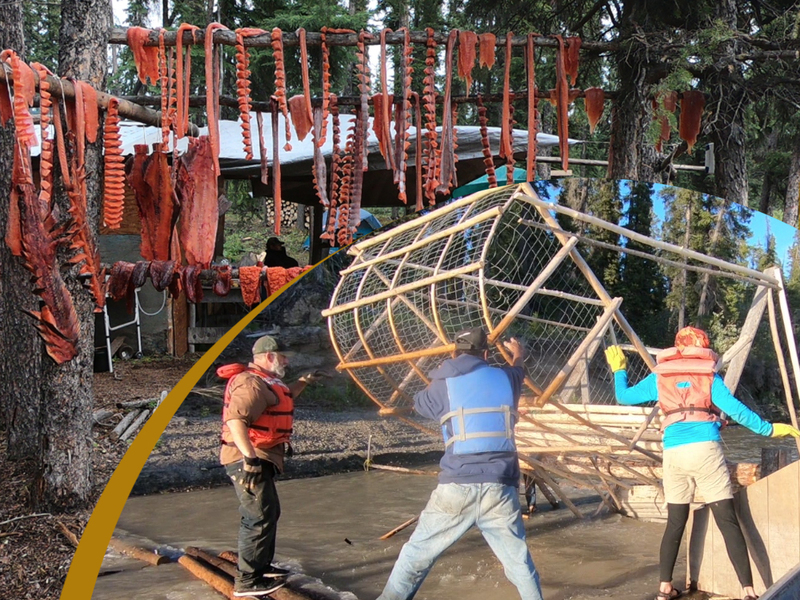 Activities at the camp include a great array of skill-building efforts: hide tanning, fishing, fish and meat cutting, making and using snares and traps, building and using a fish wheel, maintaining and using gill nets, survival skills, cooking and preservation of food (especially meat and fish), canoe-making, sled-making, and much more. In addition to practical skills, moral and ethical considerations and behaviors are also taught, and these are meaningfully situated within local and Gwich’in worldviews, life-ways, and cosmology. This project also aims to address longstanding social and community problems such as alcohol and drug abuse, and suicide. The holistic connections between daily and survival activities with behavior and self-conduct are emphasized.